Silver salmon (also known as "coho" salmon) are the mainstay of Alaska's sport salmon fishery in many areas of the state. They're aggressive feeders in salt water, and they readily strike lures and flies in freshwater. Silvers are at their fighting best when they have plenty of room to run, jump and dive, and nowhere do they have better opportunities to do all three than in saltwater. Silvers are not too finicky when it comes to striking a lure or a bait. The challenge lies in finding the fish to begin with. Depth finders are critical for this task, however if you are simply prospecting and are running multiple lines, you should stagger the depth and reach of your lines, so each one is fishing a different depth. Once you find fish, you can adjust your lines so they are running in the "strike zone" where the fish are. The same is true of mooching, where you simply adjust the depth of your offerings until you start catching fish. Use a medium-weight spinning rod or trolling / drift rod and a good brand-name reel. The Penn International series is a great choice, as it is corrosion-resistant and has an excellent drag system. 25# P-line is an excellent choice for line. In many areas silvers and kings are running at the same time, and in such cases it's wise to step it up a bit with a medium-heavy rod and 30# line. If you're trolling four lines, and you have downriggers available on each side of the boat, run the downriggers at two different depths, say, 60 and 80 feet. It's not uncommon to catch king salmon while you're trolling for silvers, and the kings typically run deeper than silvers, so you want one line down at 80' or so. The other two lines run off the back of the boat. These are your "flat lines"; run one just below the surface and the other on a diver set to run between 30'-40'. Be prepared to adjust your depth of your downrigger lines, and the reach of your flat lines. Some days you might need to run your flats in the third wave of your wake, and on other days the fish are right in your prop wash. Adjust your tactics until you start hitting fish. Fish sometimes run deeper on clear sunny days, especially if the water is very clear. Jigging with a Crippled Herring jig can be particularly effective for silvers. Because fish may be found just about anywhere in the water column, a good strategy is to jig the lure all the way to the bottom, pulling it up three feet or so and letting it flutter as it drops toward bottom. Repeat this process until the lure hits bottom, and begin again as you bring it back to the surface. The lure flutters on the descent, and it's common for fish to hit it as it drops. For that reason, be ready to set the hook when you pull up as you jig the lure. Once you hook a fish with the lure, keep constant pressure on the fish; silvers are notorious for shaking loose right at the boat, using the weight of the lure combined with slack line, to throw the heavy lure free of their jaw. Mooching can be done with whole herring, plug-cut herring or herring strips. Simply lower your line a few feet, and slowly jig the bait, letting out line until you feel the bottom. Slowly jig the bait all the way back up to the surface. If you're using whole herring or plug-cut herring, rig them so they spin as you sweep your rod tip up. This simulates the spinning action of a wounded baitfish, and attracts attention from greater distances. Your saltwater silver tackle box should include terminal gear for both casting and trolling, as your techniques may need to change to meet the circumstances you encounter in the field. If you're mooching or trolling, you must be able to adjust your depth. Trollers usually do this with a downrigger, which gives you precise depth control. If you don't have a downrigger, you must use a diver of some kind attached to your main line. In some cases, if fish are closer to the surface, you can troll with rubber core sinkers or split shot added to your main line. For mooching, you can adjust your depth by using split shot or rubber core sinkers. Sampo ball bearing cross-lock swivels, 12 ea. Owner octopus hooks, size 2/0, 3/0, 4/0 - 12 ea. Silvers are the last run of the season in many parts of Alaska, beginning their run in late summer or even the fall months. Once they arrive in the rivers, they remain susceptible to a variety of angling methods. They can be finicky biters, however, especially during mid-day on clear, sunny days. The early morning hours are often your best bet, particularly on clear rivers. Experienced silver anglers know that "the bite" usually occurs before the sun is on the water. 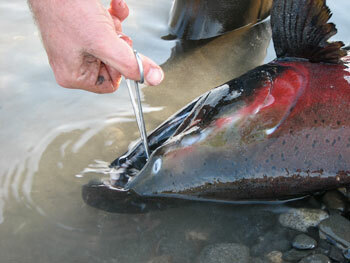 All salmon go through various physical changes upon entering freshwater to spawn. Silvers are no exception, and the transition from saltwater to freshwater brings about a metamorphosis that is absolutely stunning. Whereas saltwater fish are chrome bring in coloration, river fish often display red or flame orange coloration along the sides and parts of the cheek area. Males develop a pronounced "kype", a hooked upper jaw. The fish in the rafting photo was caught while fishing for grayling on a float hunt for moose. Silvers are often found in rivers during the month of September, when hunters are in the field. These fish will readily strike a lure, however the flesh is usually unsuitable for eating in any circumstance except in dire survival situations. By the time a silver has arrived on the spawning grounds, most of it's fat reserves have been burned off during migration, leaving the fish in a weakened state that will soon end in death. Silvers caught in spawning phase should be handled as gently as possible, to reduce the stress placed on them. Play and land the fish quickly, to avoid tiring it out. Release the fish as soon as possible, taking care to avoid taking it out of the water. Take plenty of time to revive the fish in the water, cradling it in your hands until it is strong enough to swim away on its own power. 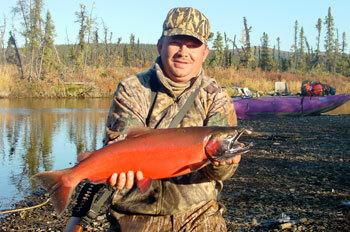 Silvers are one of the most popular salmon species caught on a fly rod. They take a variety of fly patterns, they're very strong and energetic, and quick jumpers. In short, they're everything a salmon fly-fisherman wants in a fish. For a week-long trip, you'll want a dozen of each of the flies in bold print from the list, and an assortment of the others. Flies should range in size from #2-#6. Silvers like bright colors, so go with bright orange, hot pink, red, yellow and chartreuse. Toss in a few in muted colors for bright, sunny days when fish are a bit spooked. Some anglers use light-weight bass poppers in bright colors for those days when you can get fish to strike on the surface. Each area of the state has locally-favored fly patterns, and you would do well to heed the advice of the lodge staff when you choose your flies. Most lodges have flies available for sale, so if you run out of something, they've got you covered. Salmon are hard on flies, and if you're in the thick of it, you don't want to run out of the hot pattern! Bring a spare rod and a couple of extra lines / reels. Never put the success of an expensive lodge trip in the hands of a single rod or line! Things break, and you could be stuck using lodge gear that might take some getting used to. Tackling silvers on spinning gear is a lot of fun if you have the right setup. Choose rods in the medium-action class, and good brand-name spinning reels spooled with 12#-15# test line. If you plan to release most of your fish, you could go with 20# test; heavier line allows you to land a fish quickly with a lot less stress.